The block between L and M streets will focus on the natural history of Nebraska, the transition from prairie to modern agriculture. The central plaza will feature an 80-foot map of the eco-regions of the mid-Plains -- Sandhills, prairie buttes and bluffs -- onto which will be inscribed the boundaries of the state of Nebraska. The map will include county seat locations. And a fountain with a series of rushing water jets will symbolize the Missouri River at the eastern border of the state. The two blocks leading to the University of Nebraska-Lincoln campus will include a choreographed fountain with leaping jets of water symbolizing the creative energy of imagination. A sketch of the renovated Centennial Mall looking north from the Capitol. Two commissions that keep guard over the State Capitol voted unanimously Thursday to support the Centennial Mall design and renovation. The supporters included Gov. Dave Heineman, one of Centennial Mall's closest neighbors. The support came during a joint meeting of the two groups, the local Capital Environs Commission that looks at the area around the Capitol and the state Capitol Commission that monitors the building itself. Staff from Clark Enersen Partners showed the two commissions new renderings of the design for the seven-block mall. The mall will be divided into four themed segments. The southern-most block, in the shadow of the Capitol tower, will include a circular fountain of choreographed jets emerging from the pavement, which will depict the Great Seal of the state. The block also will include granite plaques identifying each of the 93 counties and 30 plaques identifying Nebraska citizen leaders. The block between L and M streets will focus on the natural history of the state, the transition of prairie to modern agriculture. 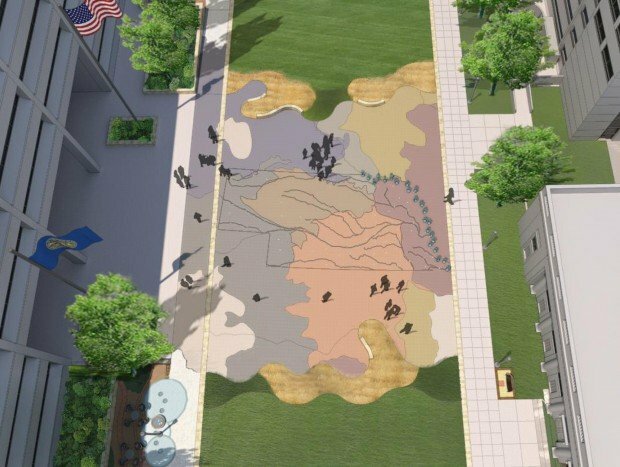 The central plaza will feature an 80-foot map of the eco-regions of the mid-Plains -- Sandhills, prairie buttes and bluffs -- onto which will be inscribed the boundaries of the state of Nebraska. The map will include county seat locations, and a fountain with a series of rushing water jets will symbolize the Missouri River at the eastern border of the state. "This combines the natural setting in which we have created a home, made our imprint," said Ed Zimmer, a Lincoln city planner who is working on the mall renovation project. The plaza map will be large enough, probably 80 feet across, so that you will have a sense of the space between Omaha and Scottsbluff, he said. That block also will be raised, so the plaza will be on the first-floor level of the State Office Building, he said. 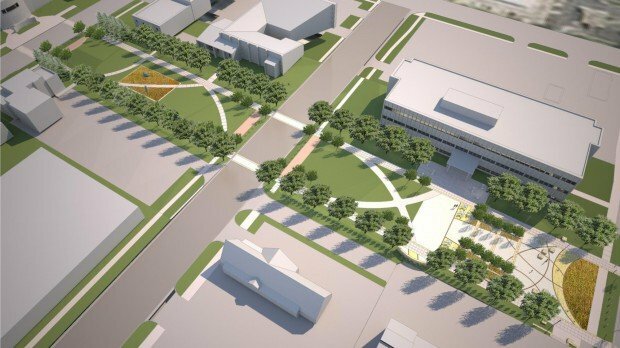 The three central blocks from M to P streets will focus on the Nebraska community, with a pathway of plaques purchased by individuals and organizations. The two blocks leading to the University of Nebraska-Lincoln City Campus will include a choreographed fountain with leaping jets of water symbolizing the creative energy of imagination. Part of the thought behind the mall design is its educational value and appeal to the 20,000 Nebraska children who visit the Capitol each year, Zimmer said. Public fundraising for the renovation, expected to cost about $9.6 million -- including a maintenance endowment -- is expected to begin early next year. The fundraising efforts for renovation of Centennial Mall are going well, Parks and Recreation Director Lynn Johnson told the commission.